Why Are Our Outdoor Rooms the Best Choice for Radnor Township, PA, Homeowners? 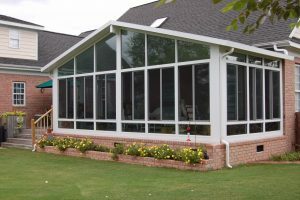 Our outdoor rooms are some of the strongest available, thanks to their heavy-duty, fully extruded aluminum construction. This type of aluminum is stronger than wood, vinyl, and roll-formed aluminum, so you won’t need to worry about your new addition being able to stand up to high winds. In fact, our outdoor rooms have even been certified to meet national engineering standards for high winds up to 110 miles per hour. While it’s important to choose an outdoor room that will serve you well for many years to come, it’s also important to select one that you can customize to match your home and your personal tastes. When you choose to have one of our outdoor rooms installed at your home, you’ll be able to choose the style, color, window system, window type, and much more. If you’re interested in learning more about the outdoor rooms we install in Radnor Township, PA, and surrounding areas, call SRA Home Products today.